Quantum sail designer and pro sailor David Armitage is making the transition from racer to cruiser as he gets ready to set sail October 5 with his wife Lana and two young boys on a nine-month cruise from Newport to Grenada and back. David Armitage has been sailing since he was a boy back in New Zealand. He first came to the U.S. with Team New Zealand and won the America’s Cup in 1995. He has designed sails for the Volvo Ocean Race, as well as major fleets like the TP52, Farr 40, and Mumm 30, but his next big challenge will be a little different than all the ones that have come before. The Armitage Sailors aboard their Beneteau 47, Nemetoma. 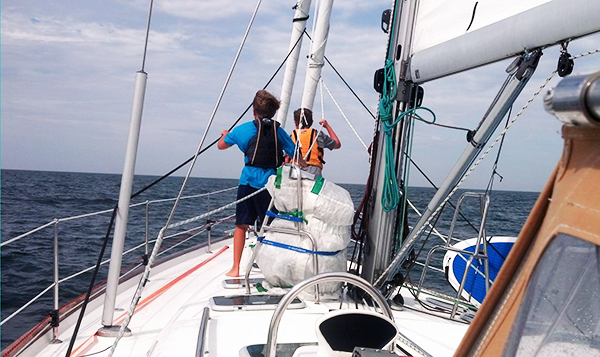 On October 5, David will set sail with his wife Lana, and two young boys, Calan, 9 and Liam, 11, from their home port of Newport, RI, in their Beneteau 47 Nemetona, which means “sacred space.” The plan is to head down to Norfolk, VA, where they will participate in the Salty Dog Rally, before David delivers the boat to the British Virgin Islands, where he’ll meet his family again. Then the four of them will sail together through the Windward and Leeward Islands to Grenada, when they will double back to Newport for an epic nine-month sailing trip. And by the way, his wife isn’t a sailor. We know—you have questions. And so did we! Fortunately David was able to take some time out of racing the Farr 40 North American Championships in Santa Barbara, CA, to talk to us about his journey from racer to cruiser, his divide and conquer strategy, how his boys reacted when he told them they didn’t have to go to school for a year, and (at least) one dirty little secret of cruising. Quantum Sails: You’ve sailed in some of the biggest regattas in the world. What is it like to transition from racer to cruiser? Dave Armitage: It’s not that hard of a transition at all. The only thing that maybe I struggle with is when we start going too slow, when there’s not enough breeze. I’m just going to put the engine on. I don’t have a lot of tolerance to sit there flapping around going four knots. I’m always looking at a sail or at the water; it’s not often that you just completely relax. I’m getting better at it lately, starting to slow down a bit more. For you, is cruising a respite, or a new challenge? It’s a new challenge. When you’re racing most of what you’re doing is with a team of people. You’re really only one part of the team, whereas with this, I have to manage a huge portion of it myself. I have to be the skipper, the navigator, I’m filling a whole bunch of roles. How do you expect this experience to add to or complement your racing resume? It’s definitely rounding out my abilities both as a sailor and as a person. It’s really invigorating. What was the initial reaction when you told your boys you were going to take them out of school and go sailing for a year? They were a little reluctant at first, but mostly they were nervous about missing their friends. Slowly came around though and now they’re pretty excited about it. Your kids will be home-schooled for the time you live on the boat, what is it like to be their teacher, and how do you balance sailing, boat maintenance, and school work? The school they go to now has been really supportive and the principal who just retired is a sailor herself. The teachers have provided the entire curriculum and lesson plans so they can follow along with what their classes are doing. Lana will probably do 70% of the homeschooling; I’ll be doing 70% of the boat maintenance and route planning, as well as some work for Quantum. What responsibilities are your kids required to assume on the boat that they wouldn’t have to if you were living on land? Each of the boys will have their own cabin, so their responsibility is keeping their rooms clean and keeping their areas under control. The boat is 47 feet, so it’s a relatively small space. It looks like a mess pretty quick. Your wife is a non-sailor and both your boys are quite young, while they are likely to learn a lot along the way, what sailing skills have you made sure to teach them before you leave land, as a safety precaution or otherwise? Man overboard drills—we’ve started to do a few of those in earnest. The kids always wear life jackets if they’re going out of the cockpit or if we’re doing any kind of passage. We have jacklines on the boat and Lana and I wear PFDs and harnesses any time we’re on deck. We also have PLBs we’ll wear when we’re doing a passage or anything more than just a day sail. The big thing this summer was doing man overboard drills where Lana and the kids took the boat and we threw a cushion over the side. I sat there and had them do it. Liam and Calan hang out on the bow of their home for the next nine months. When you bought the boat in 2012, did you have a time frame for how long it would take to get it ready? We had an optimistic time frame and a realistic time frame. Now we’re kind of zeroing in on the realistic one. It was quite a bit of work to get the house de-cluttered and ready to be rented out. Lana took on the lion’s share of getting the house ready while I focused on the boat prep so it was kind of a divide and conquer sort of thing. As you moved forward with preparation, were there things that came up that had to be done that you didn’t think about when you were first considering the trip? We could have pushed off and gone last year in terms of boat preparation, but with a little more time, we were able to look at some other things, like installing solar panels on the boat, adding a water maker, and upgrading a lot of the electrical systems and the pumps. We also did silly things like adding macerators to the heads, and I replaced a lot of hoses. So much of what you read in sailing blogs makes it seem like people are going from one disaster to another or having to constantly work on the boat, and that’s because they don’t focus hard enough on boat preparation. Do you expect to do mostly proper sailing or will you be motorsailing? That’s kind of the dirty little secret of cruising—you do a lot of motorsailng, especially in the northeast where there isn’t a lot of breeze and you’re generally trying to get places. Once we get down to the Caribbean and the breeze is a little more consistent then we’ll do a lot more sailing. What is your sail inventory like? Is there anything still on your wish list? I built an asymmetrical spinnaker last winter; I have regular big genoa on the front and a smaller staysail, as well as the mainsail. They all are Quantum sails. We’re actually trying some slightly different fibers on the sails I’m using to see how they go longevity wise in the sun and in the cruising environment, so we’re really using the boat as a little bit of a test platform. Stay tuned, Dave will be checking in with us over the coming months with updates, articles, and tips and tricks he's learned along the way. In the meantime, you can follow the Armitage Sailors on their blog and on their Facebook page.